We recently made a trip up to the north of the country to visit some of the places covered by our Merlin Pass which aren't within easy reach of our home on the south coast. The other day I wrote about the Merlin Pass attractions in Manchester, and today I'm going to share the fun that we had visiting the Merlin Pass attractions in Blackpool. On our trip to Blackpool we stayed in the Premier Inn at the airport and found that it was an easy drive into the centre, parking each day in the Houndshill Shopping Centre. We visited all the attractions apart from the Blackpool Dungeons. Although we've taken the children to the London Dungeons and they quite enjoyed it, we felt it's probably best saving that one again until they are a bit older, and besides there was plenty more to keep us busy! Most of the Blackpool attractions are located inside the Blackpool Tower itself, and the Sea Life Centre and Madame Tussauds are only a short walk away, so it's easy to visit several in one go. Jungle Jim's, the Tower Circus and Blackpool Dungeons can be booked in advance so it's probably a good idea if you are visiting during a busy period, although having said that we were able to walk straight into the Circus and Jungle Jim's at a time convenient to us. Your visit to The Blackpool Tower Eye begins with a 4D cinema presentation which was a great introduction to Blackpool as well as the Blackpool Tower. Then we ascended by lift to the very top of the tower, where we were greeted with views across Blackpool and the North West of England. There is a solid-glass Sky Walk where you can walk out onto a 5cm thick glass viewing platform and look straight down onto the Promenade below - it was pretty terrifying! You can walk all around the tower and walk up to two higher open viewing platforms, and there is plenty of signage to explain what you can see. Performances of the Blackpool Tower Circus have been running since 1894, and this year marks the 25th year with the Endresz family at the helm. You can check the performance details on the website - Blackpool Tower Circus show times - as the circus doesn't perform every day, although during the summer there are often several performances in a day. It's included with the pass, but you need to obtain a ticket from the desk prior to the performance for the specific show. Tickets are unreserved seating, so it's a good idea to arrive in plenty of time to secure a good seat. The circus is hosted by Mooky the clown and Mr Boo, and the children found them both hilarious. The circus lasted nearly two hours with an interval, so it was a long show, and there was a good variety of circus acts to entertain and amuse us. We only popped in here as it was included in our passes but it was a lovely place to visit. The Wurlitzer organ was playing (you can check this before you go in) and even though it was late in the afternoon there were people dancing. We sat watching for a few minutes, and I can see that it would be a lovely place to sit for afternoon tea! We visited Jungle Jim's soft play area twice, and the children loved it. It's a large soft play frame with a jungle theme. Adults aren't allowed onto the play equipment itself but you can supervise from nearby walkways within the frame. Ours are old enough to go around it themselves now (which is lovely!) but there is a smaller area for younger children if you want to stay with your child. Because the sessions have limited numbers there was plenty of room to play, and plenty of spaces at the tables and chairs to sit down. Drinks and snacks are available but there is no obligation to purchase anything. The sessions last for an hour, which we found was plenty, and the first session of the day lasts for an extra 15 minutes as well as being a lot quieter so it's worth aiming for if you can. Blackpool Sea Life Centre is a short walk along the promenade from the Tower. This summer, all the Sea Life centres are taking part in a Finding Dory event with an interactive trail where you can find out about the real life versions of the characters. There are letters to spot in the tanks, and if you complete the trail you will receive a little reward. We've visited quite a few of the Sea Life centres now and must admit that they are all broadly similar. The children still really enjoy visiting though and there is always something new to spot. The Seahorse attraction was particularly interesting, and Harry was very interested in the new Jurassic Seas exhibit as he's always been fascinated by fossils. When we came out of the Sea Life Centre it was a pleasant surprise to find that the Pirate Adventure Mini Golf located underneath was also included in our passes. There are 12 holes spread over two levels and with lots of pirate themed obstacles it was a really fun course to play. Madame Tussauds Blackpool is located right next to the Sea Life Centre. It's a smaller attraction than the London Madame Tussauds, and because of this we found it much less busy, meaning that you can spend longer looking at the individual waxworks and their themed areas. You can 'meet' characters from Coronation Street, TV stars like Harry's idol David Attenborough, and royalty including William and Kate. Our favourite area was the Festival Fields, where Mia spent ages doing kareoke to Let it Go, and they both had fun changing the light displays around Ed Sheeran, Olly Murs and Justin Bieber. As I said above, we didn't visit the Blackpool Dungeons on this occasion as our children (aged 7 and 5) are still quite little. But it looks like a fab attraction - a similar format to the London Dungeons but with a local twist. All these places to visit certainly meant that we had a busy few days in Blackpool! We still had time to sit on the beach though and explore the town, we particularly enjoyed spending time in the arcades on the 2p machines and even managed to just about break even with some strong willpower to not put all the winnings straight back in again! I'd definitely recommend Blackpool for a short break! 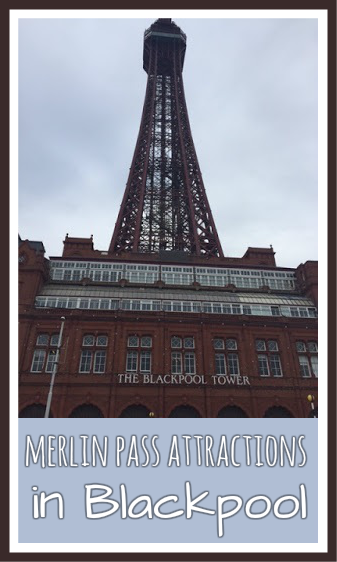 I think we might have to do Blackpool next year - my OH wasn't keen when I suggested it, but def worth using the merlin pass! It's definitely worth a visit, we were surprised by how much we enjoyed Blackpool! Even though it was the summer holidays it wasn't that busy and it was easy to get around and reach everything, really tourist friendly, and lovely beaches.